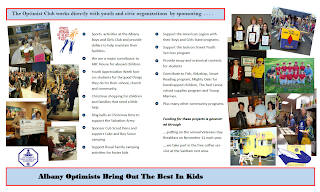 Has your Optimist Club developed it's plan of action for May? 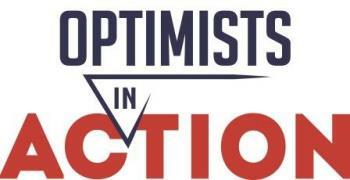 What is Optimists in Action month? It's a time for your Optimist Club to engage others in projects that serve your community in a positive way. Yes, we know that you conduct many youth and community serving projects throughout the year. Perhaps you always include other groups in your activities. But at this time, especially, we want to see and hear about them! Tag your Facebook posts with #OptimistsInAction and share your stories here so that we can help you share what being an Optimist Volunteer is all about. This week, the Optimist magazine was received by Optimist Club members around the world. 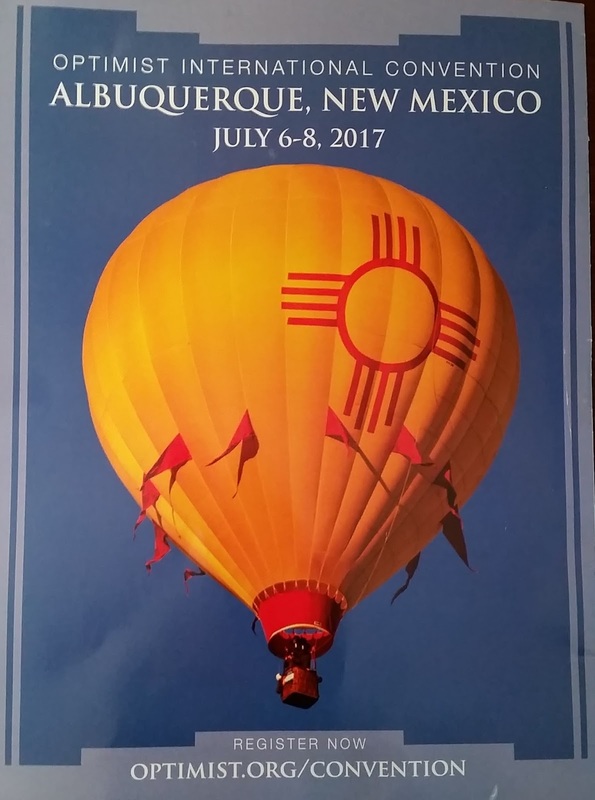 On the back cover was this inspirational picture of what many think of when they imagine a trip to Albuquerque: the Balloon Festival. 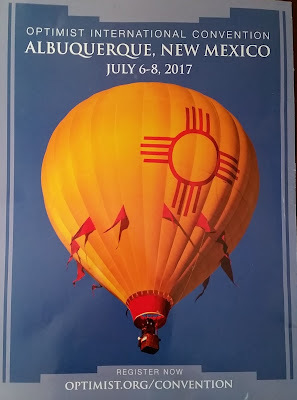 We may not get to see the Balloon Festival in full force - it takes place in October - but when the Optimist International Convention opens on July 6-8, 2017, there will be enough hope and optimism to float a million balloons. In addition to carrying out the business of the organization and being informed for our upcoming year, sharing optimism is what the convention is all about. Optimist Clubs come together once a year to share hope and plan for the future. Click here to make hotel reservations. Early bird registration ends on May 1. Please register today to save. Registration will be accepted online until July 5 and onsite registration will be available at that time. Keep up to date with the 99th Annual International Convention by visiting http://optimist.org/e/member/convention1.cfm. 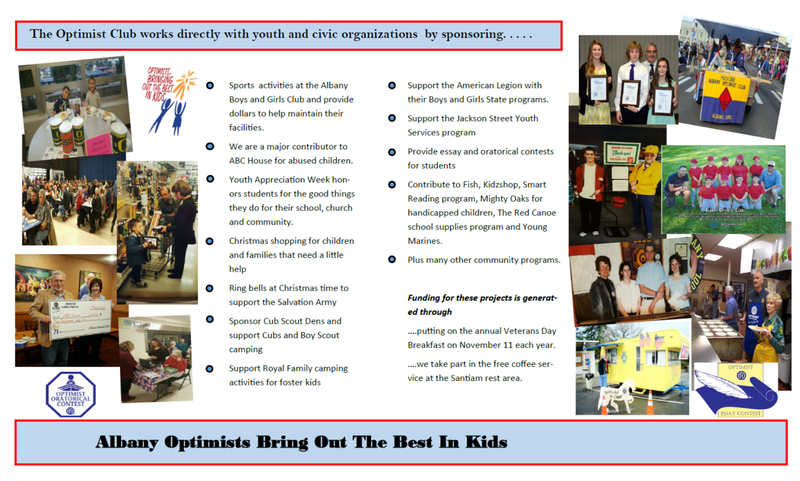 Earlier this year, as part of its ongoing membership drive, the Albany Optimist Club updated its brochure. 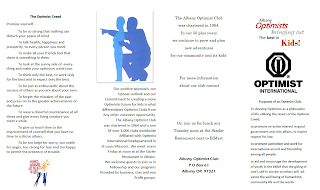 Bulletin editor Jack Towns produced the accompanying brochure to help tell the Albany Optimist Club story; that is, what it does, where it meets, and why it does what it does in the community. 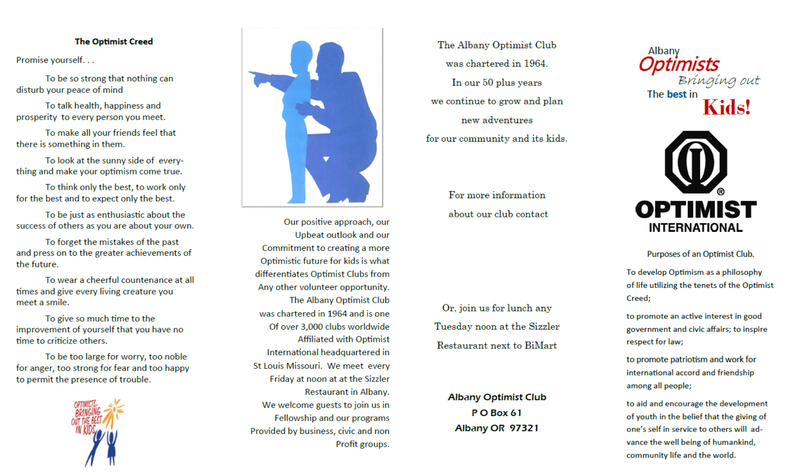 It is a very straightforward format that your Optimist Club can and should follow. A club brochure helps recruit new members and is a great resource when asking businesses and individuals to make a donation to a particular cause. Moreover, a club brochure also serves as a membership retention tool. When members see the great things they have accomplished, they know that during the year, they have made a difference and they recall the fun they had doing it. They remember why they are Optimist Volunteers. If your club hasn't updated its brochure in a while, please do so. New pictures of new and traditional programs will energize your members and your community to do more. In about thirty days or so, high school graduation will take place around North America. Many Optimist Clubs will be involved with recognition assemblies and graduation parties, among other things. Something we hope they will also be involved with is new member recruitment. Junior Optimist International (JOI) members will be graduating and heading to college or work after an earned summer respite. For the first time, Optimist International has made it easy for those new grads to transition into an adult Optimist Club. For those who wish to join an Optimist Club upon high school graduation, there are no dues and no processing fees. That's right! That is free membership for a full calendar year for graduating senior JOI members. How's that for a membership recruitment tool? <<AWESOME>> and <<EASY>> are just two words that come to mind! If your Club has a graduating Junior Optimist senior who wishes to take advantage of this offer, contact membership@optimist.org or call 800-500-8130 ext. 226. The Vancouver, WA Optimist Club recently held its third annual Youth Appreciation event recognizing students from Gaiser, Curt Scheidel, and Jason Lee Middle Schools. According to The Van-Guard bulletin editor Mary White, about 75 people joined the club at Salmon Creek United Methodist Church for the festivities that included a pizza and ice cream social as a prelude to the award presentations. The Vancouver Optimist Club works with the middle schools to recognize students for overall citizenship. Mary reports, "This program goes beyond the academically and athletically gifted to recognize those who 'make a difference' in many ways to their schools." 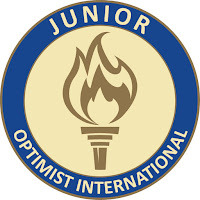 Optimist International has promoted Youth Appreciation since 1956 as a way to recognize students for their positive behavior and contributions to society. 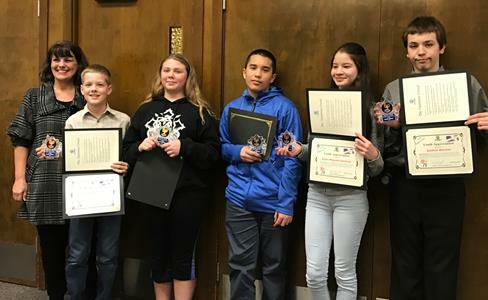 It was once celebrated only in November; however, Optimist Clubs work with students year-round and now use the Youth Appreciation recognition awards as a way to interact with students at different times of the year. 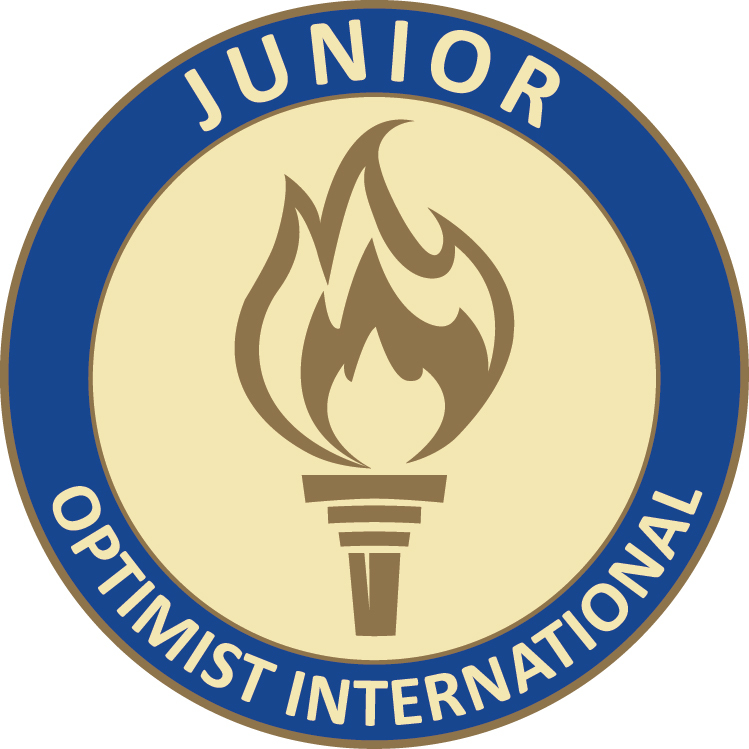 Please click to find out more about Optimist International Youth Appreciation programs. Students speak about "What the world gains from optimism"
It's that time of year. 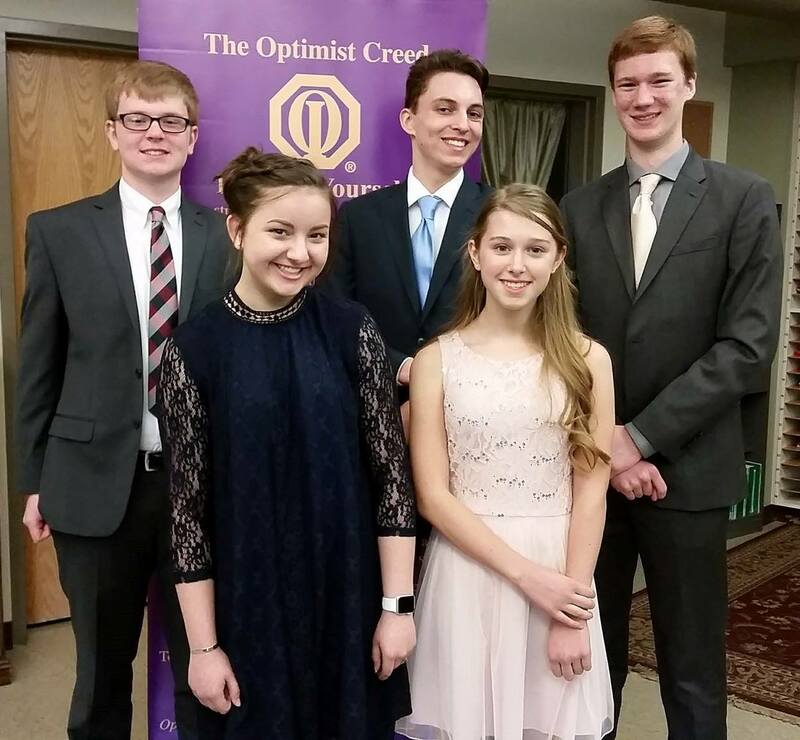 Optimist Clubs around the world are hearing from amazing students in the Optimist International Oratorical Contest. The students on the right recently participated in the West Tacoma Optimist Club's annual event. Listeners heard about Thomas Edison, Winston Churchill, football players, personal heroes and even the Revolutionary War as they learned about the official topic, "How the world gains from optimism." As always, it was inspiring. 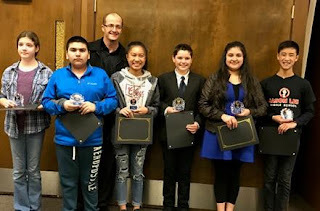 Two of these students* will move forward to the Washington Zone 4 competition on April 22 where they will compete with other speakers from the Tri Cities and Vancouver Optimist Clubs for the opportunity to advance to the PNW District competition on May 5-6, 2017 in Burnaby, BC. The winning speaker in the District competition earns a $2,500 scholarship, second place $1,500 scholarship, and third place $1,000 scholarship. From the District level, one student will advance to the Optimist International World Championships. Only the second year for the global competition, one student will compete for an addition $20,000 in scholarship prizes. All awards are paid on request to the student's college by the Optimist International Foundation or the Canadian Children's Optimist Foundation. Find out more about the Optimist International Oratorical World Championship scholarship contest at this link. *To comply with Optimist International contest rules, the names of the students are not published to maintain anonymity as they progress through the event. It's spring! The grass is getting greener, the sun is setting later, and everyone wants to be outside. For some, outside means on the golf course and those are the folks this post is written for. If your Optimist Club likes golf or if you know some talented young golfers or even some who are just getting started with the game, we want you to know that there are two opportunities for junior golfers to qualify for the Optimist International Junior Golf Championships in the Pacific Northwest. Register online at the Junior Linkster Tour Canada page. Register online at the US PNW Northwest District Qualifier page. Winning players in the top age categories are eligible to move forward to the Optimist International Junior Golf Championships at the PGA National Resort & Spa, Palm Beach Gardens, Florida. Click to learn more about this world class event welcoming more than 600 junior golfers from 40 nations.